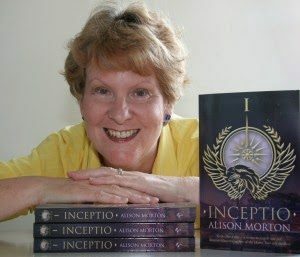 Alison Morton has tagged me in this blog hop where I’ll answer questions about my main character in the Tales of Ancient Rome series. Alison writes a series of alternative history “what if” thrillers set in Roma Nova, a survival of the Roman Republic which is located in Central Europe and which by the 21st Century women have not just achieved true equality but something approaching dominance. 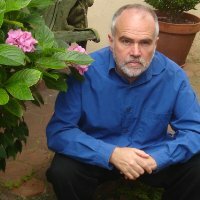 The first two books, Inceptio and Perfiditas have already been published and the third, Successio, is due in mid-2014. You can find out more about them at her website, and please visit her blog to read the answers to her questions about her own main character. My Caecilia (Aemilia Caeciliana) is a young Roman woman who is the neglected half-caste child of a wealthy plebeian man and a patrician woman. When she is orphaned, her uncle and the generals of Rome use her as a pawn in their political ambitions by marrying her to an enemy Etruscan nobleman, Vel Mastarna, to seal a tenuous truce between the warring cities of Rome and Veii. 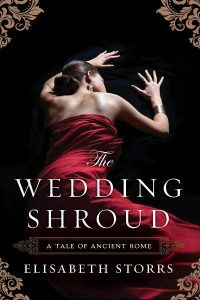 The Wedding Shroud commences in 406 BC in the Rome of the early Republic but the action soon moves to Veii, an Etruscan city that lies only twelve miles across the Tiber from its neighbour. Caecilia leaves behind the austere Rome to discover an hedonistic culture which offers education, independence and sexual freedom to women and forces her to grapple with conflicting moralities. Ultimately she must determine where her loyalties lie: her birthplace or her husband’s world. Her decision to forsake Rome leads to war. Seven years later, in The Golden Dice, Caecilia is perceived as an enemy by the Veientanes yet knows that, if Veii should fall, the Romans would execute her as a traitoress. In the upcoming Call to Juno, Caecilia must summon even greater reserves of strength at the height of the siege to prove her loyalty to Mastarna’s people, and ensure the survival of her family. Caecilia is born into an insular and intolerant society where women were considered the possessions of either their father or husband, and could be killed for adultery or even just for drinking wine. Furthermore they were expected to adhere to ‘Roman virtues’ such as modesty, piety and chastity. She was a lonely child, neglected by her parents, although her father later grew to love her and provided her with an education which was unusual in Rome. Her natural intelligence and inclination to question authority irritates the generals who are prepared to wed her to an enemy in a situation that may well lead her to being held as a hostage to war. She is bears a purple birthmark on her throat which portends that her life will not be smooth in the eyes of the Romans yet is believed by Mastarna to be the sign of a fortunate marriage. When she encounters the liberal, decadent Etruscan world with its mystical religion, she is at times bewildered and confronted yet is also curious to experience new ways (and she does love Etruscan pretty shoes and jewellery)! Apart from being naive and vulnerable, she can be very, very stubborn, (and prudish) which often causes her to ‘takes two steps forward and one step back’ throughout her time in Veii (which causes some readers to be frustrated with her, or even dislike her.) She is not above temptation, though, and slowly shrugs off her inhibitions when it comes to the pleasure Vel Mastarna gives her. Most importantly she is a survivor who must withstand constant threats from forces both within and without her husband’s city. In The Golden Dice, we see her mature into a loving wife and mother who wants to prove her loyalty to her adopted home. And she again shows the true courage required by women in war to protect their children while their warrior husbands face the constant threat of death. Caecilia finds herself thrust into the decadent, sophisticated and opulent world of Veii with its intriguing and mystical religion (which she learns also has a dark and savage side). The liberal nature of Etruscan society both delights and frightens her as it causes her to question all that she has been taught in Rome, and all that she believes in. By the end of The Wedding Shroud, Caecilia must choose between Veii or Rome. 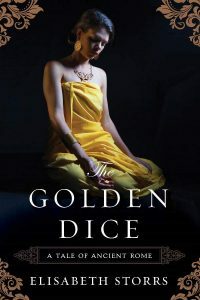 In The Golden Dice, she must prove to her adopted people that she is no longer loyal to Rome which, in turn, requires her to question if she really wants to see her birthplace destroyed. In Call to Juno, as both sides line up for the ultimate conflict, Caecilia must finally determine whether she can ever be wholly Etruscan and exorcise the ‘Roman’ remaining within her. Caecilia endeavors to understand the conflicting moralities, beliefs and loyalties of the two societies while always striving to ensure those whom she loves are kept safe. Is there a working title for this novel, and can we read more about it? When can we expect the book to be published? 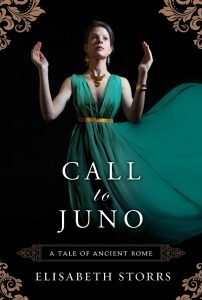 Call to Juno will be released in April 2015. And who am I tagging to answer the same questions on their blog on 24 April? Elisabeth Storrs is the author of The Wedding Shroud and The Golden Dice, the first two books in the Tales of Ancient Rome series. The third book, Call to Juno, will be released in 2015. Subscribers to her newsletter will receive a free copy of her newly released short story, Dying for Rome: Lucretia’s Tale.